The official results of legislative elections on 9 April 2014 General Election Commission put PDIP at the ranked first with 23,681,471 votes (18.95%), followed by Golkar: 18,432,312 (14.75%), Gerindra: 14,760,371 (11 , 81%), Democrats: 12,728,913 (10.19%), PKB: 11,298,957 (9.04%), PAN: 9,481,621 (7.59%), PKS: 8,480,204 (6.79 %), Nasdem: 8,402,812 (6.72%), PPP: 8,157,488 (6.53%), Hanura: 6,579,498 (5.26%), PBB: 1,825,750 (1:46%), and PKPI: 1,143,094 (0.91%). Bottom two of political parties, namely PBB, and PKPI are declared not qualify parliamentary threshold (3%) and did not get any seats quota in parliament. Since none of the party with the most votes above 20%, as a condition of Presidential thrashhold to be able to carry a pair of candidates for president and vice president themselves, the coalition of political parties is a must. In the presidential system in Indonesia, election of coalition partners is also directed by the vote or seats in parliament (at least 50 percent +1), which is then tied in a mutual political platform. After the legislative elections is resulted in maneuvering the political elite to form a coalition at the presidential election May 9, 2014. Because the public orientation to the above figures of a political party is still a presidential election winning political formula, then the composition selection of the Presidential Candidate - Vice Presidential Candidate is very important to the victory of the candidate pairs. Of the various movements of some leaders of political parties, eventually converging on a two couples of Presidential Candidate - Vice Presidential Candidate for which respectively carried by supporting political parties to compete seizing power in Indonesia from 2014 to 2019. Two strongest pairs are Prabowo-Hatta and Jokowi-Jusuf Kalla. Prabowo-Hatta named their coalition as a Red White coalition carried by Gerindra, PAN, PPP, PKS, Golkar and PBB that total votes are 48.93%, or 292 seats in parliament. While the duo Jokowi-Jusuf Kalla brought by a coalition party of PDI-P, Nasdem, PKB, Hanura, and PKPI with a total of 39.97% of the total votes in 2014 legislative elections, or 207 seats in the House. After receiving the serial number of the National Election Commission, the duo Prabowo-Hatta (serial number : one), and Jokowi-Jusuf Kalla (serial number : two), two sets of candidates on June 3 at Bidakara Hotel signed an integrity pact for peaceful election in Indonesia later dated July 9, 2014. Peace Election Post-Declaration, each contestant campaigned to all corners of Indonesia to share their vision and mission to the community, followed with national or global issues considered to be of importance and urgency. The question that a distinguish colleague and dear frined of mine prof. Anis Bajrektarevic has recently asked in his luminary work “Europe of Sarajevo 100 years later”, ‘Was history ever on holiday?’ – is nearly answered, at least this time in Indonesia – the 3rd largest democracy in the world. Borrowing the term of Herbert Feith, there are two types of political leadership in Indonesia, namely "manager type" (administrator) and type "unifying type" (solidarity maker). Leaders with the administrator type are those who have the technical ability to govern the state. This type is generally represented by educated leaders who master a particular field. While the leaders of the solidarity maker types are the ones who are able to approach the masses, influence them, as well as gain wider sympathy and support from community. If seen from figures of Presidential Candidates: Prabowo and Jokowi, both are the solidarity maker type because of their capacities to make both of them are not only popular among their supporters, but also have a relatively high electability in the public eye. The difference is, that Prabowo as a solidarity maker figure has high performance characteristics, while Jokowi is more low performance. High performance of Prabowo is manifested in the figure of confident, assertive and bold, while the existing low performance of Jokowi lies in its simplicity aura everyday. Meanwhile, Vice Presidential Candidate of Hatta Rajasa and Jusuf Kalla, both equally can be characterized as figures considered expert in managing government (administrator) for some experiences as bureaucrats and state officials. The difference, Hatta Rajasa is more low profile, while Jusuf Kalla is quite a high profile in his performance. Of both pairs have benefits and deficiencies of each. But the leader of solidarity maker type with high performance (Prabowo) could further demonstrate his capabilities as a leader because he had a better motion and political communication, including in attracting public support. While Jokowi looks less good for political communication. The high imaging seems too strong to be on his shoulder. Signaled himself as the party officer and Doll Presidential Candidate is a heavy burden amid the Presidential Candidates and their popularities. Path "on leave" as the governor also indicated that Jokowi judged not to confident in contestation to face Presidential Election 2014. Currently, campaigned as a Presidential Candidate, executing tasks of Jakarta Governor are undertaken by the deputy governor, Basuki Tjahya Purnama (Ahok). It means, if Jokowi lost the battle for the number one seat in Indonesia later, he could take back his position as Jakarta Governor. Candidate for Vice President has the low profile administrator type (Hatta Rajasa) seeming to be able to work together in government. This type is similar to the figure of Indonesian vice president, Boediono, now. Not much to say, experienced, courteous, and competent. Jusuf Kalla also balanced. Jusuf Kalla has plenty of experiences in the government bureaucracy. The difference, Hatta Rajassa is the General Chairman of the Party (PAN), moreover Jusuf Kalla is the former coriander of the Golkar Party which also rely on the popularity as Jokowi. The problem is also that Vice Presidential Candidate, Jusuf Kalla (72 years) is much older than Jokowi (52 years) as a candidate for president. The Second Symptom Captain in one vessel can not be avoided. Two captains are not among Jokowi with Jusuf Kalla, but also between Megawati and Jusuf Kalla later. During the campaign period ahead of voting until July 9, 2014, the vision-mission of both pairs are louder presented to the public, ranging from a matter of economics, education, health, environment, food, energy, law enforcement, until about fighting corruption. Which did not escape that should be of concern is how the performance of Indonesian foreign politics of the two couple of candidates later. It's no secret if the issues of foreign politics is often a secondary priority compared to national issues. But the fact that a peaceful election in Indonesia should be able to be a major capital and stimulus to improve active role in regional and global arena, as mandated by the opening of Constitution 1945 paragraph 4 to participate in creating a world order. In the short and medium term, foreign politics still faces two strategic issues. The first is the traditional security challenges, such as separatism and border disputes. Separatist Action of Free Papua Movement (OPM), or the work of Malaysian who do not appreciate status quo territory, at Camar Bulan and Tanjung Datu in West Kalimantan border needs to be addressed explicitly by the new Indonesian leader. The second is non-traditional strategic issues, as transnational crime such as terrorism, money laundering, climate change, maritime security and others. Crimes at sea such as illegal fishing, illegal logging, illegal mining, human trafficking, drug trafficking passing Indonesia sea channel continued. Moreover, Indonesia is directly adjacent to the 10 countries in the sea and only 2 countries on the land. In the context of maritime security, Indonesia needs to be a leadership pioneer in ASEAN to be bold against China on issue in South China Sea, especially if China enters the water territory of Natuna as part of its claim. Indonesian shall enforce Exclusive Economic Zone and freedom of navigation in accordance with norms of international laws. Therefore, modernizing Indonesia military is a must. As has been described above by the author, figures of Presidential Candidates Prabowo and Jokowi has solidarity maker type. The difference is the leadership style off Prabowo Subianto having characteristics of high performance, while Jokowi is more low performance. Meanwhile, Vice Presidential Candidate of Hatta Rajasa and Jusuf Kalla, both equally can be characterized as figures considered expert in managing government (administrator) for some experiences as bureaucrats and state officials. However, Hatta Rajasa is more low profile at work, while Jusuf Kalla has high profile type. At glance there are similarities if you look at the vision-mission of foreign relations between Prabowo-Hatta and Jokowi-Jusuf Kalla. Both pairs equally lays self-reliance principle of Indonesian people in facing the global challenges ahead. Prabowo-Hatta and Jusuf Kalla Jokowi Visions in maritime sector both want to build ports. Each of the Presidential candidate pairings equally want contract re-negotiation between the Indonesian Government with the foreign companies that have been operating in Indonesia for quite some time, who have a number of issues that deemed harmful to the interest of the Indonesian people, for example Freeport in Papua and Newmont in West Nusa Tenggara. National needs and interests are articulated through foreign politics of both pairs. But masculine characteristics in the implementation of the Indonesian foreign politics from Prabowo-Hatta are more pronounced for protecting the nation, play an active role and confident in facing the global arena (Outward Looking). The hope of Indonesian nationals are more respected by other countries, inside or outside the regions. Prabowo-Hatta is considered to have the competence to anticipate issues and challenges of traditional security. Prabowo-Hatta International slogans about 'Revival Indonesian' becoming Asian Tiger is a high performance leadership style in Indonesian foreign politics. While the more feminine performance of Indonesia's foreign politics looks of the duo Jokowi-Jusuf Kalla. Concentration of Indonesia's foreign relations will be more focused inward looking. Visions-Missions of Jokowi-Kalla are more based on the national interest and the desire to strengthen the identity of Indonesia as a maritime nation. The idea is to save Indonesia's marine wealth that will be done by building the fish processing industries, as well as improving transportation links for large ships at strategic locations. The idea of the need for the Indonesian people to do 'mental revolution' as a guide to the 'Wonderful Indonesia' is the slogan of the foreign politics implementation of a low-performance-high-profile. 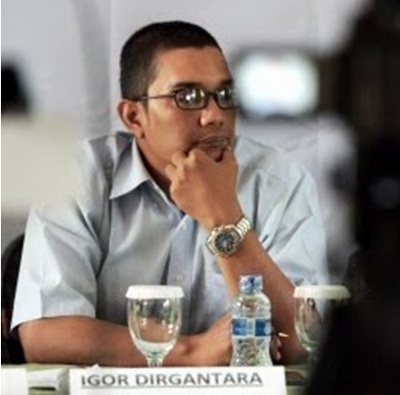 Igor Dirgantara is senior researcher and lecturer Lecturer at the Faculty of Social and Politics, University of Jayabaya, Indonesia. Herbert Feith, The Decline of Constitutional Democracy in Indonesia, Jakarta, Equinox Publishing, 2007. Rebecca Grant & Kathleen Newland, Gender and International Relations, Buckingham, Open University Press, 1991. Prabowo Subianto, et. all, Membangun Kembali Indonesia Raya, Jakarta, Institute Garuda Nusantara, 2009.